2018 Global Citizen Application Released! September 6th 2017. We are delighted to officially release our 2018 Global Citizen Application Form! Now you can apply to be a 2018 Global Citizen and join Coaches Across Continents as we continue to travel the world, working in communities with partners from 6 different continents, while using sport for social impact. Create your own Global Citizen Legacy. For more information on being a Global Citizen with Coaches Across Continents please read the Global Citizen Application Guide and check out this webpage. August 7th, 2017. 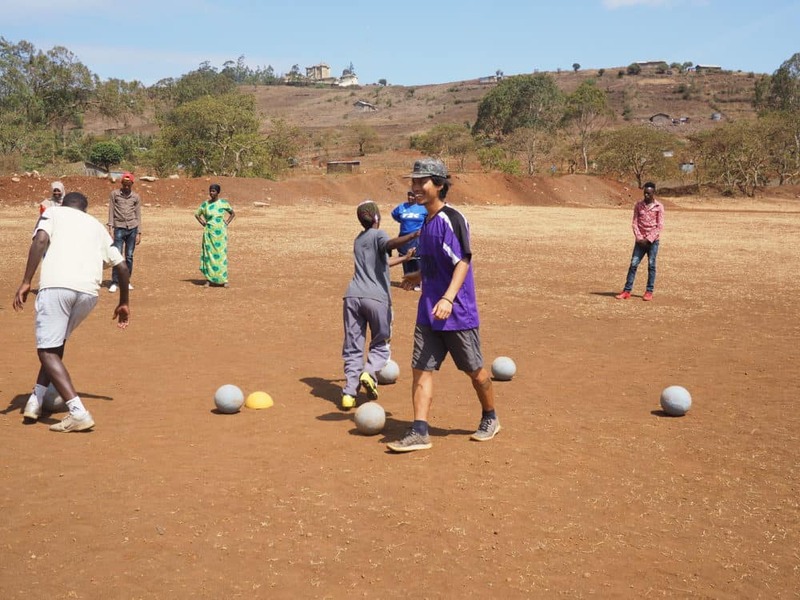 Salim Blanden, CAC Community Impact Coach and Founder of CAC partner Mbarara Sports Academy in Uganda, writes about his experience working for Coaches Across Continents on-field with Horn Of Africa Development Initiative (HODI), in Kenya. Migori, Rusinga Island, Mogotio, Nairobi – our next destination would be Marsabit with HODI (Horn Of Africa Development Initiative) for our fifth and last program in Kenya. Our ten hour trip to Marsabit started at 7:00 AM in Nairobi with everyone looking forward to working with HODI, an amazing program near the Somalia border which is ran by Fatuma Adan, a recent graduate of law. Fatuma established HODI as a community-based organization in 2003 to address the inadequacy of access to legal services for the poor people of Marsabit. She shunned salaried employment at the judiciary to, instead provide a small legal aid desk for people who needed, but could not afford legal representation in court cases. The organization has since grown to be the voice of championing peace and development in Marsabit through advocacy, education, community cohesion and livelihood support programs – all through using football. Today, HODI serves close to seven thousand people with offices in Marsabit and Moyale. For me, I was looking forward to a great week working with an organization that has a lot of meaning to the people of Marsabit. As usual, we would start the training on Monday morning. But before we began we held a meeting with Noor Abduqadri, a worker with HODI, and other staff who talked to us about their expectations and what they wanted to learn from Coaches Across Continents. They also wanted to tell us about things to talk about and what not to talk about. 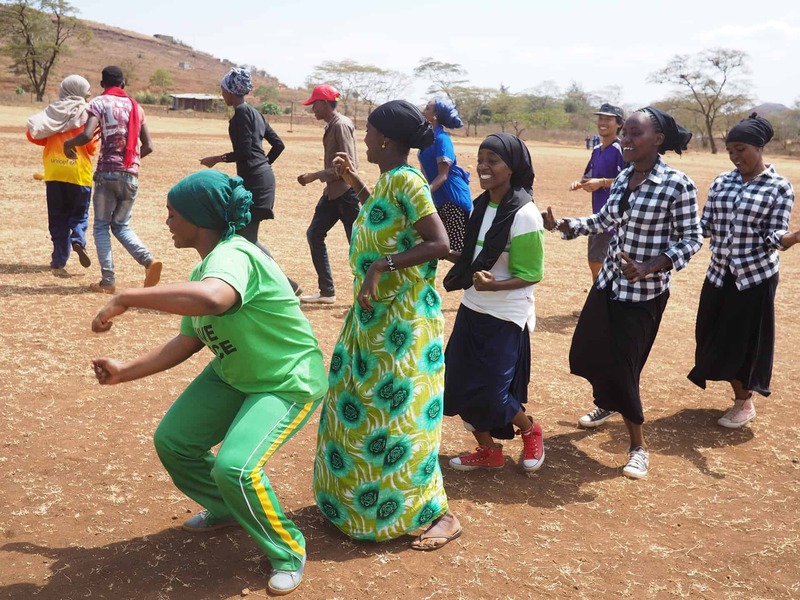 Since Marsabit is purely a Muslim majority region, most female participants would wear long dresses commonly known as ‘the Hijab’ and also cover their heads at all times during the training sessions. Noor expressed his fear that the female participants would not be open to us since we were all male. Knowing that Mumina, a staff from HODI and one of the female participants, would be training with us, I knew everything was going to be possible. As this was going to be our second week conducting a program as Community Impact Coaches (CIC), I did not want to ask a lot from Mark Gabriel – our leader from CAC. But, I did want to find our own way of running a better week with my friend Nicolas Achimpota, a CIC from Tanzania. Our first day on Monday was a great one and very exciting, especially when we started to play. There were no religious issues, the girls felt free to play with boys and were comfortable with us which was not what we thought. This program was unique because we had more female participants compared to males, which was rare to me. All of the past four programs we did in Kenya had more male partcipants than females. For HODI, it was different, proof of how this organization has empowered women in Marsabit. Majority of the girls were very active throughout the program and during our school visit to one of the primary schools in the area, it was the girls that coached games. Our third day was a short one, because of the anticipated President’s visit for a political campaign in Marsabit. 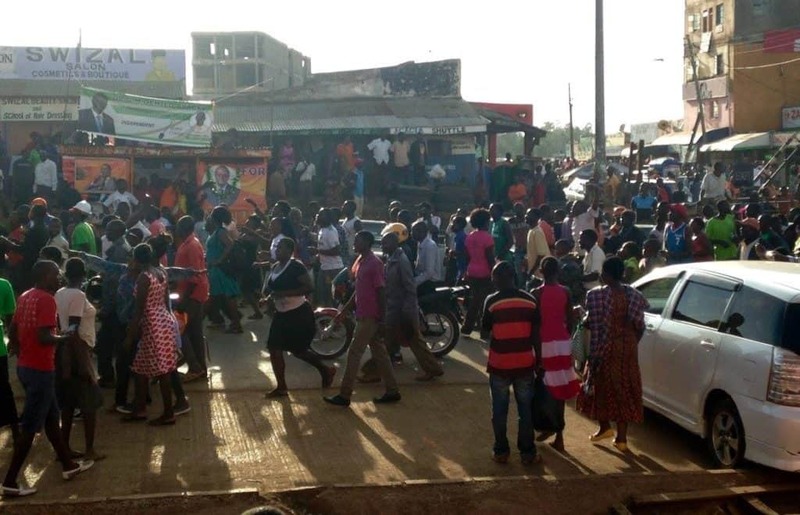 The President of Kenya was campaigning in Marsabit with a few days remaining to the country’s general elections, and people all over Marsabit wanted to attend this campaign. With little time to the end of the program, one of the participants told us the town would not be a safe place to pass when the president arrives. We decided to stop the training and go back to the hotel, which was the best choice for us. As soon as we reached the hotel, the president arrived and had a peaceful campaign that lasted about one hour with a lot of security personnel on all the streets of Marsabit. After the president left however, conflict broke out between tribes that supported different county candidates, and the police intervened. We decided to lock ourselves in the rooms until we were sure of safety outside. After the situation normalized in the evening, I knocked on Mark’s door for a long time but he never responded… Later told me he would not risk opening for anyone, even if he knew them. We laughed about it! At the end of the week, we decided to go back to the field to do the last training and give out certificates, we also wanted to hear their experiences regarding the violence and what they thought ahead of elections. The coaches held a meeting and talked about how they could keep safe as community leaders during the election period. They all believed that what they had learned from CAC throughout the week and the messages they had learned from the games, especially those about peace and conflict prevention, were necessary for them to practice. For me this was a clear sign that we had created positive impact at the right time through games. July 26th 2017. 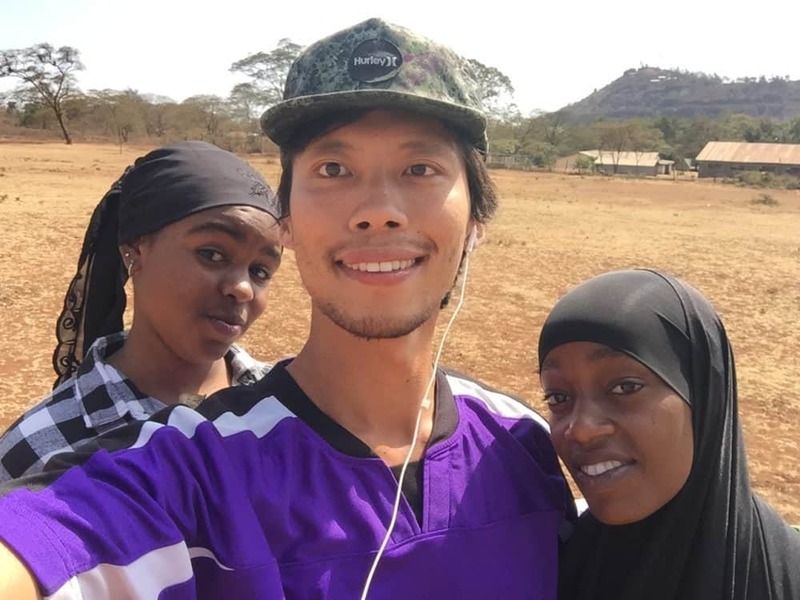 Global Citizen JK Cho writes about his week on-field working with Mother Child Health Foundation in Kenya. “This Is Africa” (“TIA”). People come to Africa and often hear this remark, meaning don’t complain and just shrug off inconvenience or misfortune coming from the cultural or technological difference. As much as I have enjoyed the epic natural beauty and people’s kindness of Africa, I also had to overpass some TIA moments: Catching malaria and spending nights with neither power nor running water were somewhat predictable. It was mentally, physically, and spiritually challenging making a seven-hour-long minivan bus (“matatu”) trip on the bumpiest road I’ve ever been on with 20 people and a bunch of fish and dead animals crammed in. Wherever I go, I would get followed by dozens of kids and get yelled at endlessly, “mzungu (nomad or white man).” If I get lucky, they would call me “China.” Oh, I copped me my Ghanaian tattoo in Kumasi, that is a burn scar on my calf from the exhaust while I was riding a motorcycle taxi (“boda boda”). I was very close to losing it in Gomoa Benso when people full-blasted commercial messages in the streets (like outdoor concert style), from 2 am to 8 am every single night. Anyway, these all are unique, cute experiences. When this sort of event happens, I now tell myself it’s one more story to tell when I get back to the states. 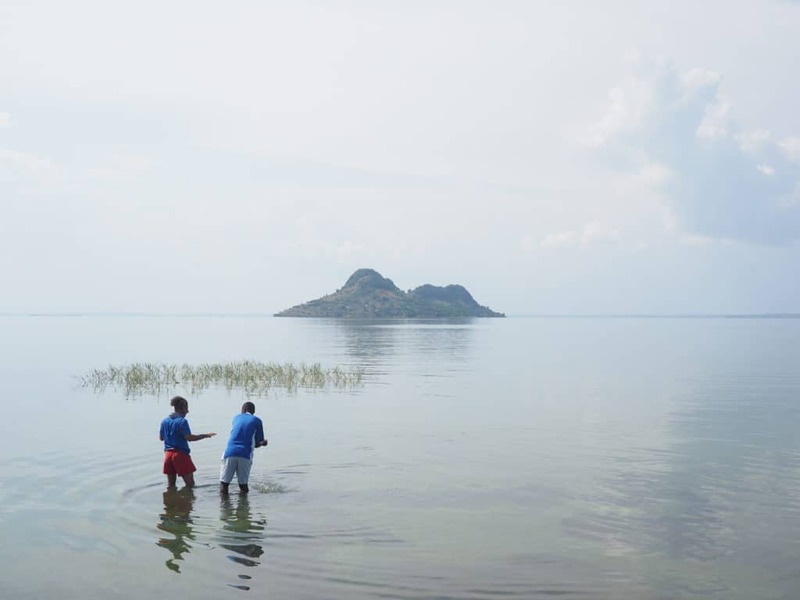 However, it becomes a nightmare for people working in Africa when their project is put in danger for a “TIA” reason, like this week’s program in Rusinga island in Kenya, for example. Mother Child Health Foundation (Mother Child) was founded by Mary Okech in 2016, with a mission of achieving “0” maternal mortality rate in Homa-Bay County. One day Mary found out that her fourteen-year-old cousin was unwantedly pregnant along with 24 more girls in her high school. The girls starved while they were attending classes, skipping breakfast and lunch. Most of them ended up dropping out of school to find a job to support themselves and their fetus. Mary was mad and devastated and started providing the girls 10 to 20 Kenya shillings (10 – 20 U.S. cents) a day so they could eat and keep going to school. In spite of her beautiful mind and passion, Mary had felt inadequate to pursue the task continuously, and Mother Child consistently had faced financial and organizational challenges. Mary found out about Coaches Across Continents (CAC) through her mentor, Joseph, who had had a partnership experience with CAC, and requested a partnership with CAC. Although the start-up charity for young pregnant women’s health was not directly related to training teachers to discuss Self-Directed Learning, CAC decided to work with it to promote sustainable changes in the community. When Team Kenya arrived at Rusinga island, however, things were a lot different from what we were expecting. We found out that Mary got a new job in Nairobi in the mean time and moved out of Rusinga island, so Mother Child had to stop operating tentatively. There was no program. On the first day of the program, a handful of participants from a boy football team showed up, hoping to move to the states, because they thought we were recruiters. T.I.A… Did I not learn that things are subject to get real (or unreal) at any moment? I later figured that there was a significant gap of the way people do things and the expectations between CAC and Mother Child. A lack of technological access in the island also limited communication. CAC takes a considerable amount of risk in designing and executing a training program in about 60 different developing countries. It runs 21 programs in Africa this year, and each program is expensive and extremely labor-intense. The nature of social development work in Africa let alone involves lots of uncertainty. Things and words could change quickly here. Language and cultural barriers and limited internet access make it tougher to coordinate a program with a partner in a small rural village. I believe the uniqueness in CAC’s partner selection adds even more risk. CAC choose to work with community’s need based, not based on charity partners’ qualifications and potentials. In other words, CAC seems to want to give an opportunity for any communities who need its help rather than limit it to successful and notable charities. That isn’t a logical decision for growth and security from the business stand point, but a brilliant move for choosing meaningful impact and keeping its integrity. CAC is a mission-driven organization that makes mission-integrated decisions. That is why CAC finds some of these unideal situations ideal. And that is also why CAC is a leading global social impact organization winning Most Impactful Companies and Beyond The Sports awards. And then, what happens is that CAC coaches do magic. These guys are working on the frontline of global social impact, playing multiple vital roles. A lot of CAC’s partners in developing countries have organizational and operational weaknesses. Those weaknesses are big obstacles for them to work with international NGOs like CAC hindering their functions and sustainable growth. Besides providing training, CAC coaches create shared value by consulting about a clear vision and mission, strategic directions, relevant impact measures, and functional networks. Helping partners constructing these essentials would consequently improve CAC’s program quality and impact progress in future years. Traveling about 4 to 7 months a year CAC coaches have to be an excellent coach, an international project manager with extensive sympathy, and a travel expert with high-stress tolerance. It really takes a special talent and personality to do the job. This week’s hero was coach Mark Gabriel. When we discovered the program was in danger of cancellation, Mark didn’t let that happen. He grabbed Mary, basically rebuilt Mother Child, and saved the program for the whole week. The flying squirrel (Mark’s nickname) first arranged a partnership with a boy health organization in the island and established a foundation to visit schools and provide proper sexual and maternal education. And then, he talked to a women’s vocational school and other women organizations in the island and got some of the teachers and students involved in Mother Child as volunteers. He customized and complicated female empowerment and sexual health related games for Mother Child. Additionally, Mark created surveys and matrix so Mother Child could record and monitor their activities in the future. Finally, he promised Mother Child that he would give a year-around support to Mother Child as an impact consultant. While Mark was beasting, I backed him up by breathing entrepreneurial fumes all over Mary. Mary now feels empowered and believes running Mother Child is her destiny. She believes CAC’s mind-training- using one’s own body helps make a habit of identifying one’s issues, taking actions, and make changes. Mother Child now has a structure, tasks, and people to work with. She said her long-term goal is to build a school for young pregnant women in Homa Bay. The training result also turned out pretty well. 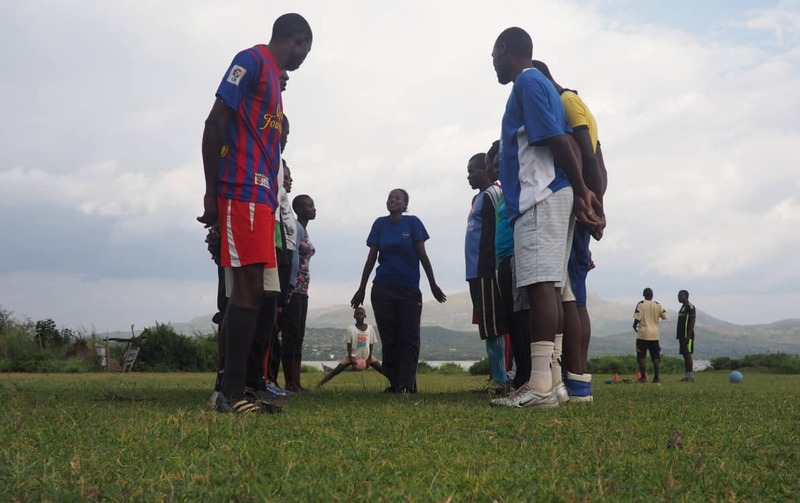 27 Rusinga Islanders of local teachers, students, volunteers, and players participated the training. As a result, we estimated the program would potentially benefit 493 children. The size of this week’s program was nothing impressive, but the meaningfulness of the impact was tremendous and would be memorable. CAC finds another unideal ideal place and gets one-step closer to its mission. July 11th, 2017. 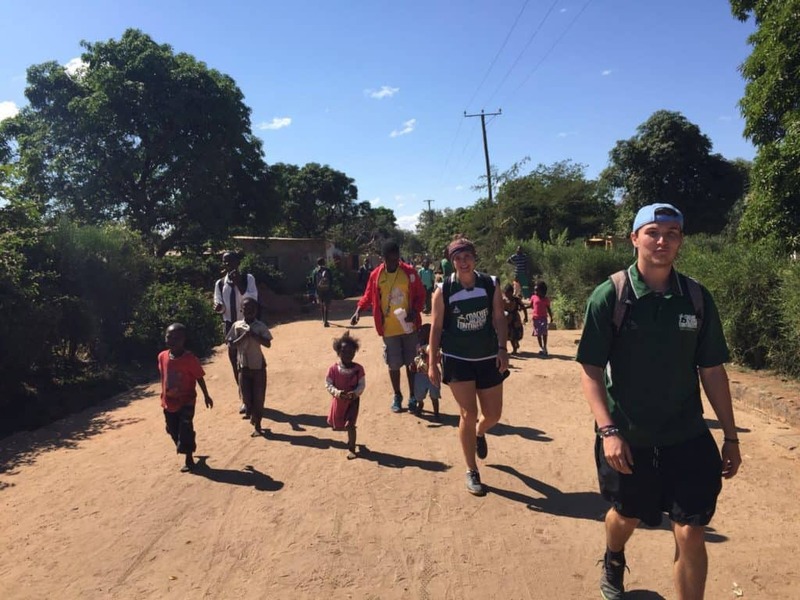 Community Impact Coach, Salim Blanden, writes about his experience working in Migori with Youth Empowerment through Sport, also known as YES Kenya. 24th June 2017, on a sunny Saturday, my journey from Kampala to Kenya began. On the bus along with me was my colleague and first time ever Community Impact Coach, Nicholus Achimpota from Tanzania. I was so excited to learn I was going to spend the next five weeks on field with Nico. This would be my return to Kenya after running the first program in 2015 in Mbita, Homa Bay with Boychild Agenda. On the bus however, we missed our team leader from the USA, Mark Gabriel because of weakness due to a sickness. Mark stayed in Kampala and would travel the following day. 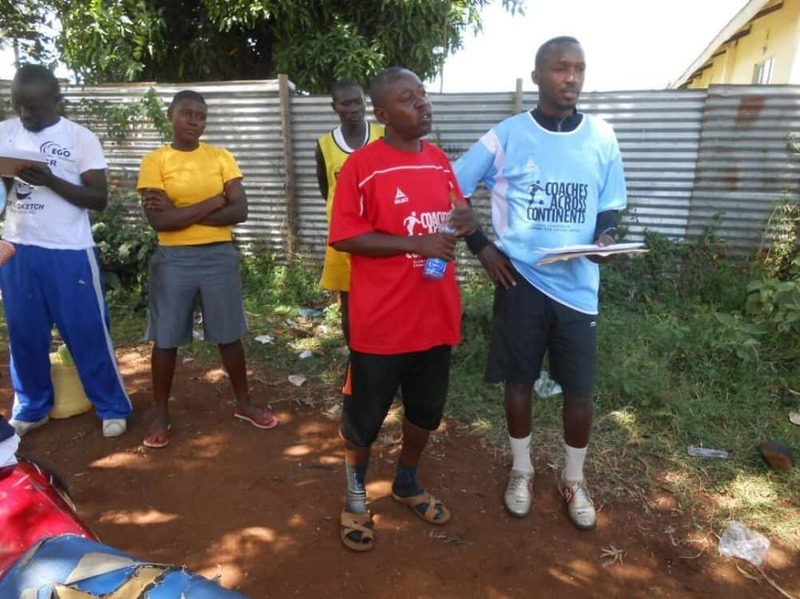 Our on-field training with Youth Empowerment through Sports (YES) in Migori started immediately on Monday morning with about 30 participants from Migori, and some others from neighboring areas around Migori County. Due to Mark’s absence on-field, it was very clear myself and Nico would run the program on our own. This was therefore the first ever Community Impact Coach ran program. A participant said, “I enjoyed this program so much because I really see myself in you.” This showed the value and power of having a CIC led program. The experience was great because we managed to take charge and everyone believed in us. Mark also motivated and encouraged us throughout the whole week. This was an example that local coaches (Community Impact Coaches) can make an impact and run programs in different areas, independently and bring about positive social change in communities where they work. It was evident there was an impact created because of the cooperation of the participants. Especially with games reflecting gender equity, communication and fun, there was a message that CAC games and participants would continue bringing about positive change even when CAC has left the local area. The excitement I got from slaughtering chickens for our lunch on two separate occasions and the confidence I gained from running the program as only a CIC, made me forget the cold night we spent in Kisumu Town Roads before we traveled to Migori one early morning. This taught me a lesson in life, to never stop moving despite the different challenges on the road! Now we are delighted to say that OD has been recognized for his incredible work by the Charity Film Awards who have nominated his film about our ASK for Choice initiative. BUT, we need your help to ensure he is rewarded further! We NEED you to go online and vote for this film to win the award! Click here to vote. With your help we can fully celebrate an unsung hero of CAC’s success. Watch the nominated video below. For more of OD’s work please go to our videos page. May 3rd 2016. 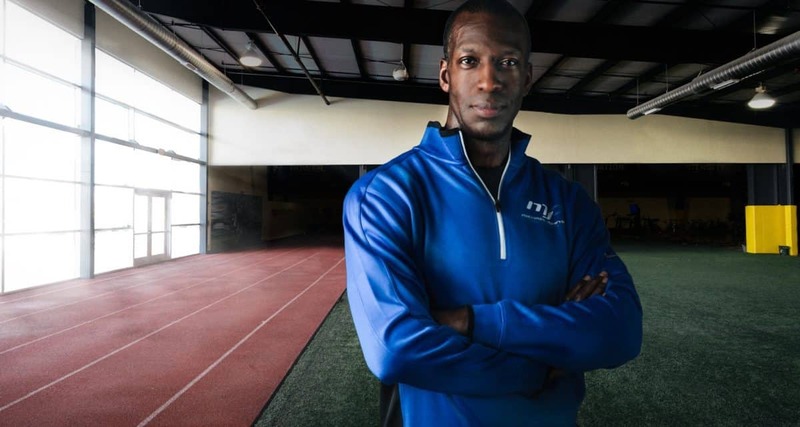 Olympic legend Michael Johnson recently announced the launch of his Foundation. The Foundation’s initiative, spearheaded by the four-time Olympic gold medal winner, aims to provide young people from around the world with the tools they need to fulfil their potential through sport. By developing an in-depth, sustainable programme focusing on sporting performance, leadership development and community engagement, the Michael Johnson Foundation will give specially selected young people – all of whom come from a diverse range of challenging backgrounds – the confidence, skills and resources to make a positive impact on their futures. The young leaders once-in-a-lifetime journey will begin with an intensive course at the Michael Johnson Performance Center, Michael’s one-of-a-kind training ground in Dallas, where they will be provided cutting-edge support to enhance their sport performance skills, receive in-depth leadership training and get time and support to develop their ideas about how they can contribute to their communities and make a genuine difference for fellow young people back home. The young leaders will be travelling to Dallas this month from all over the world – Mexico, Nepal, UK, Cambodia, Armenia, Kenya, Uganda, India, Brazil and Tanzania – and were carefully selected not only for their potential to develop sporting talent but their capability to lead and a desire to contribute to their community. Coaches Across Continents is delighted to be a part of this initiative. As a global leader in sport for social impact, the organization was honored to be asked to facilitate the recruitment and selection of qualified young leaders for the project as well as supporting them before, during and after they take part in the course in Dallas. We are pleased to have been able to work with some of our implementing partners and offer this opportunity to their most promising young leaders. The selected young leaders have the capacity to become strong role models in their community and make the most of this life-changing project. We are extremely grateful to Michael Johnson, Beyond Sport and others who are helping these young people reach their full potential. Thanks to project partner Beyond Sport for the majority of this post. 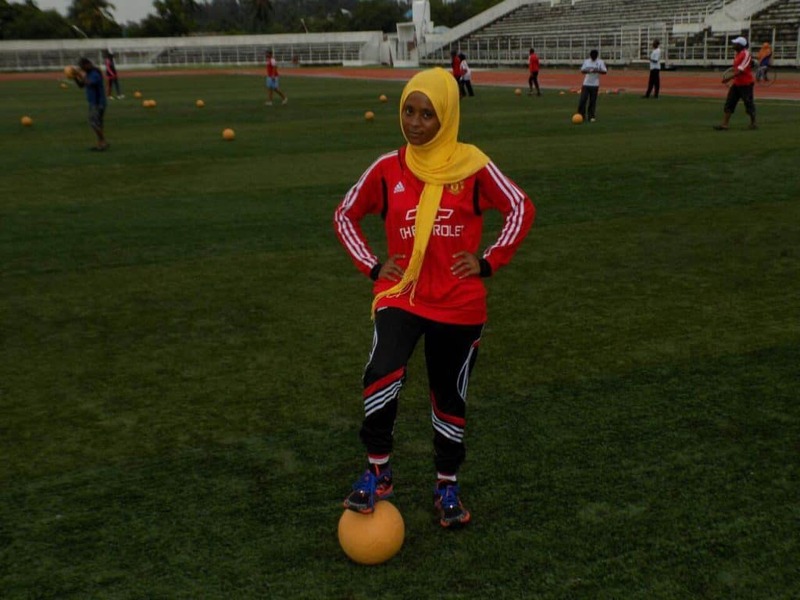 Fatma, from Zanzibar, is one of the selected young leaders.